Zaun’s double skin 358 security fencing system, HiSec DualSkin. 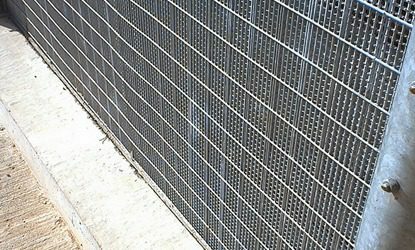 Specifically designed and developed for applications and sites that require a more robust solution than standard 358 mesh. The HiSec DualSkin features two layers of the traditional HiSec 358 welded mesh with 76.2mm x 12.7mm open mesh sections. These double skin 358 security fencing panels are welded together with the secondary panel turned 90 degrees. This makes a very tight 12.7mm x 12.7mm mesh configuration, which is difficult to cut and almost impossible to climb. The small apertures of the mesh section is also small enough to ensure effectiveness against objects being passed through and is highly resistant against the use of hand or power cutting tools. The double skin 358 mesh also conforms to BS1722 Part 14 Category 4 and has been extensively used in prisons and by the Ministry of Defense (MoD) to protect high security assets. The tight pattern of the double skin 358 mesh makes it almost impossible to pass objects or contraband through the fence into restricted areas. HiSec DualSkin provides an ideal solution for a wide variety of high security perimeter, integrated solutions and access control applications. Additional fence toppings can also be used to add extra security to the fence line. Each system may be galvanised only or galvanised and polyester powder coated in your choice of RAL colours. For a full list of colours Click Here. Pedestrian gates are single leaf 1.2m wide, (or width to suit). Framed in a 100mm x 50mm RHS with Zaun HiSec DualSkin mesh bolted onto the frame, with a slide latch. Each gate also features a rubber bump stop and 2 x suitable gate posts. Vehicle access gates are double leaf (single leaf vehicle gates available) 3.0m wide (or width to suit). Framed in 100mm x 50mm RHS, with Zaun HiSec DualSkin mesh bolted onto the frame, with drop bolts and slide latch. Each vehicle Gate also features a rubber bump stop and 2 x suitable gate posts. Samples of Zaun HiSec DualSkin are available upon request, to request your free sample please click here. Note: HiSec DualSkin can be applied to any height up to 6 metres & can also be made as a full or partial panel.